Alicia Keys stopped at New York City's Madison Square Garden last night (March 17) during her "Freedom Tour" and gave her hometown fans a special treat with surprise performances from Beyoncé, Jay-Z and Swizz Beatz. Alicia Keys and Beyonce onstage together for the first time! Alicia Keys and Jay-Z repping for their hometown! With Beyoncé making a surprise appearance onstage, it was only fitting that her husband would do the same at the self-proclaimed "House that Hovie built." 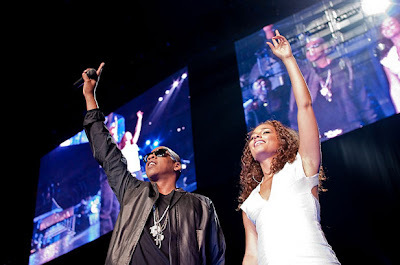 As Keys momentarily stopped playing the piano, her alleged boyfriend, producer/rapper Beatz, took the stage to his own collaboration with Jay-Z "On To The Next One," before Jay-Z himself came out for a performance of "Empire State of Mind." Scenes of Times Square and the city skyline appeared on the jumbo screens behind, setting the perfect backdrop for the Big Apple anthem as the masses sang in unison and waved their hands in the air.